Wow! These Wednesdays just keep sneaking up on me, but that's a GREAT thing...it means it's time to showcase another budding blogger! This week we have a fellow South Carolinian! 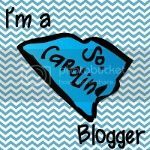 You don't want to miss this Carolina Girl's blog! Check it out and become a new follower. Hey Ya'll! 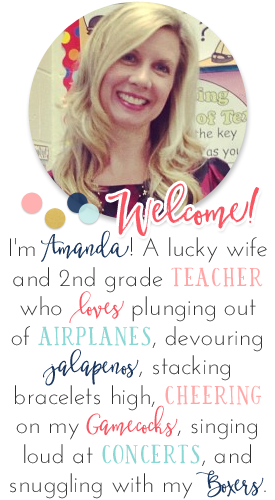 I am so excited to be here today sharing a little bit about myself on Amanda's fabulous blog! She is amazing and I am honored to be here as part of her Blogger's Showcase. My name is Karen and I have a new blog called An Apple a Day in First Grade. I hope you enjoy reading a little bit about me! stalk, shop, create teaching materials, and spend time with my family. Mr. M and I celebrated our 15th anniversary this summer by taking a Caribbean cruise! teach first grade and absolutely love it! 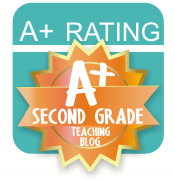 different grade levels has definitely helped me in my teaching. Click on the picture for a link to this postcard. This school year will mark 18 years! classroom and into the role of an instructional coach or interventionist. for teaching all of the core subjects. surprisingly enough, would be a close second. work together and problem solve. learning. It takes a lot of hard work at the beginning of the year to establish this, but it really pays off in the long run! What gets you through one of "those" days? always find something to laugh about at the end of the day! A nice, cold coca-cola helps as well! summary of a favorite classroom activity/project. positive learning environment with just a few simple techniques! until I finish my Master’s next summer! Thank you Amanda for hosting me on your blog today. And, a big thank you to your followers for taking the time to read a little bit about me! Stop by sometime and say "Hey!" over at my blog. I love new followers! Thanks Amanda for featuring me on your Budding Blogger Showcase! I am honored! Your blog has been an inspiration to me throughout this new blogging journey! check out my blog to see what this linky party is about! Thanks for hosting this, I love meeting new bloggers. I'm heading on over to Karen's blog to check it out.